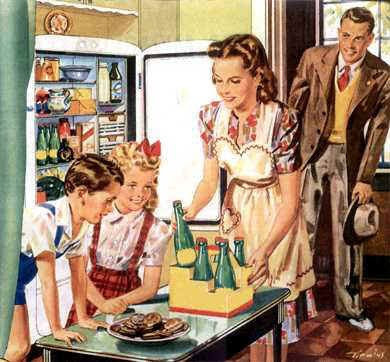 "Honey, I know you're busy giving the kids those nutritious sodas..but, have you seen my hat?" He opens his drawer…and….Voila! The black socks are there. This exchange goes on and on…until I am fully awake and must stumble down the stairs to make breakfast for our three children. I could’ve slept another precious half hour because my children are still sleeping. However, this is impossible because I’ve had to find things. Things that are easily found…if only he would look. I decided to take a different approach this morning. I was comfortable in my bed. I didn’t have to go anywhere this morning and my children were all still snoozing at 6:00 a.m…..when the onslaught of questions began. Today, I waited a full minute to answer my husband when he asked where his brown loafer was. Within seconds, he found the other shoe in his closet….right next to the shoe he was holding. I’m not Sacagawea, for Pete’s sake. Our home isn’t so large that you need a map with a little arrow that states, “You are here.” Things are fairly organized and put in the most logical places. I just don’t know what happened in a matter of ten years to make my husband believe that he can no longer find things without my assistance. I’ve asked other women this question and they are as dumbfounded as I am. I thought I would be sassy and give him a chart of locations and items like the kind you find at the grocery store….but, that would just end up being more work for me. It’s not like I don’t have anything else to do with three little boys all under six years old and a mountain of dirty laundry that rivals the size of Mt. Everest. I guess if that is the only thing that I fuss about, that’s not too bad. I just hate giving up ten extra minutes of sleep to help him find a belt that is hanging right in front of him….in the closet…where he took it off the night before. Maybe I should reconsider the chart…and a map?